starve and the economy doesn’t collapse and loans don’t dry up in the year or two beforehand. The rest of Behar deals with how to help a kinsman in financial straits and a prohibition against idolatry and order to observe the Sabbath and venerate the sanctuary. More on this later. In Behukkotai, we read how good behavior (i.e., obeying the commandments) will lead to rewards (peace, fertility, etc. )and disobedience will cause a lot of bad things as a direct consequence. For instance, if you continually refuse to let the land rest every seven years, the nation will be conquered and dispersed, so the now-desolate land will finally get its denied years of rest. The section describing all the potential horrors is referred to as the minor Tochachah (warning/rebuke – we’ll get to the major Tochachah in the summer). But there is always a chance to repent and make things right again. The rest of the portion deals with technicalities concerning pledges, assessments, and tithes. Rabbi Tzvi Hersh Weinreb at http://www.ou.org/torah/article/rabbi_weinrebs_parsha_column_parshat_behar-bechukotai . “Sin is a process. Egregious sins have a history and are long preceded by minor, even trivial, infractions. That’s the bad news. A Mathematician (M) and an Engineer (E) attend a lecture by a Physicist. The topic concerns Kulza-Klein theories involving physical processes that occur in spaces with dimensions of 9, 12 and even higher. The M is sitting, clearly enjoying the lecture, while the E is frowning and looking generally confused and puzzled. By the end the E has a terrible headache. At the end, the M comments about the wonderful lecture. As the first day of April has largely become a day of nothing online but jokes, fake press releases, preposterous rumors (or, at least, more preposterous than they are normally), and the infinite re-sharing-blogging-tweeting-plussing of such, I think it is high time that those who reject such foolishness and need to get real work done take this day back. I say we make this first of April, and every first of April to come, the day where we take a digital sabbatical We use this day to take a break. Perhaps get an honest day’s work in. \ If you are at work, perhaps this is a good day to clean your office. If at home, take the kids out to a museum. Perhaps this is the day to put on your favorite road songs, get in the car, pick a direction, and drive for a few hours and see where you end up. Because that place, no matter where it is, will be better than just about anything else you will see online today. While Anglo-Saxon curses often deal with body parts, Catholic curses go for blasphemy, and the Middle and Far East do their version of “Yo Mama,” insulting ancestors, the Yiddish curse has a baroque splendour in its intricate ability to prophesize. The most spectacular lull the “victim” with a positive opening, which then turns into a juicy, literate, malediction that no mere obscene word could possibly convey. According to the Proverb: “A curse is not a telegram: it doesn’t arrive so fast.” Like Jewish caviar, the Jewish curse must be savored. But alas, as with far too much of our glorious heritage, JYAs (Jewish Young Adults) have lost the art. 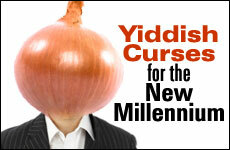 So for you, my dear readers, I’m presenting the best Jewish Curses: old and new. May you use them in good health, mein kind, and with noble purpose! This entry was posted in Uncategorized and tagged atonement, Behar, Behukkotai, jubilee, Leviticus, process, punishment, Rashi, reward, sabbatical, sin, Tochachah. Bookmark the permalink.